BEAUTIFUL ANDROGYNOUS DISCOVERY HIRO MIZUSHIMA IN NUMERO TOKYO, NOV 11. We are in the midst of a newfound obsession with androgyny seeing the number of trans-beauties getting major face time on the runway and in campaigns. Of course we all know Andrej Pejic and Lea T as faces of the movement, but did you know about this one? Too incredible for words. My jaw was on the desk. But I was wrong…. This is the magic of makeup and wigs and clothing. This is Hiro Mizushima, a talented Japanese actor who pulled off the character created for the shoot with aplomb. It’s one of the most inspiring fashion pages I have seen in a long while. It’s edgy yet thoughtful, shocking but not crude—it’s a testament to beauty in all forms. 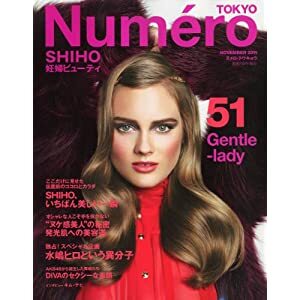 Bravo to Numero TOKYO and the team on the shoot- keep the bar set high!! And Mizushima too, you’re quite incredible….I’m really happy for you and imma let you finish, but Joan d’Arc did the best androgyny of all time. …I just have to make sure the law is laid. 1. It’s nice to see celebrities represented as the artists they are (ok, some anyway) and not as merely commercial products always thrust upon us in magazines. This is why the power of mags are still necessary…it would be difficult to pull things like this off with celebs without their pull. Celeb culture in Japan had me totally turned off and I’d never heard of Mizushima before, but now I`m very curious to see his work. 2. The fashion world is notorious for switching love childs every season, and while the androgyny bit seems to be a bit perilous in becoming a flavor of the day, I am wondering if this goes deeper. Perhaps it will be a definition of the 21st century’s idea of beauty? VERBAL, YOON, KEITA MARUYAMA, VOGUE GIRL ALL DOLLED UP. One comment on BEAUTIFUL ANDROGYNOUS DISCOVERY HIRO MIZUSHIMA IN NUMERO TOKYO, NOV 11.